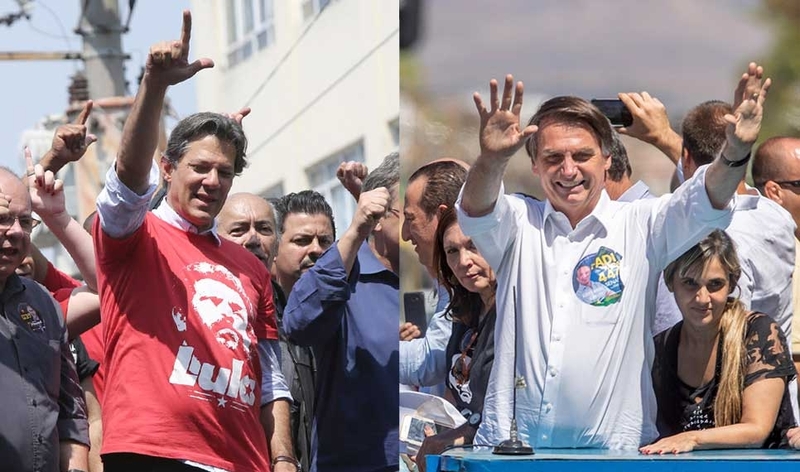 Fernando Haddad (left) and Jair Bolsonaro on the campaign trail. Many consider this election to be illegitimate due to the imprisonment of the former frontrunner, Lula da Silva. Photo by AP. Today Brazilians are voting on who will be our president for the next four years, with the latest opinion polls showing the two candidates neck and neck. Paraphrasing the philosopher Vladimir Safatle – who said there would not be elections in 2018 – we can say that no matter who wins the election, there won’t be governability in Brazil. Safatle was referring to the lack of legitimacy of the presidential campaign given that the leading candidate, Luis Inácio Lula da Silva, was in prison. However, I am referring to the serious challenges either candidate will face in trying to govern after the election, due to the strong opposition they will encounter. The former head of state from the Workers’ Party (PT), Dilma Rousseff, suffered a coup in 2016 and the Congress is today more conservative than ever before. The resistance against PT candidate Fernando Haddad will be enormous, even though the majority of the deputies elected from that party. Similarly Jair Bolsonaro has already said that he won’t accept defeat. He also said this week that once in power he will arrest Haddad, other PT congressmen and people from social movements such as the MST and MTST. An opinion poll from October 25th (Data Folha research institute) showed far-right candidate Bolsonaro (PSL) winning with 56% of the votes, and Fernando Haddad (PT) growing in support to 44%. A poll by Vox Populi out today indicates that the race may be closer still, with both candidates on 43%. Nevertheless, in both cases a great part of the votes are more a rejection than an affirmation of the people’s will. Many people from the left and the center are voting for Haddad not because of his party or his government project but to say #EleNão (#NotHim), to stop the rise of the so-called neo-fascism. The opposite is also true. Many people from the centre and the right (identified as liberals) are voting for Bolsonaro in repudiation to the Workers Party, a result of years of anti-left propaganda. In spite of the presence of PT strongholds like Heliopolis, São Paulo and the rest of the South and Southeast voted overwhelmingly for Bolsonaro in the first round of voting. Photo republished with permission. It is worth pointing out that there is a division in our society that is not merely the structural division between the workers and the ruling class. We have a division within the working class, the class that lives from their work. There are women voting for Bolsonaro, just as for decades we have witnessed poor people supporting liberal policies like the privatisation of essential public services such as health and education. It is not a particularly new phenomenon, it is the ideology of the ruling class as the expression of the hegemonic ideas in a given time and space. So instead of ridiculing the poor who vote for a political project that represents the greed of the elite not the need of the people, it is important to understand the nature of such a discourse that is able to connect antagonistic classes, antagonistic interests. If we analyse Bolsonaro’s discourse, it does not necessarily contradict his Christian worldview. Even though he is talking about torture as a positive means to achieving a goal, he finds justification for this sin through a punitive religious ideology that asserts that if you don’t behave well you must/will be punished. He also finds justification for his ideas within the nation state manichaean logic of the good and the bad citizen. 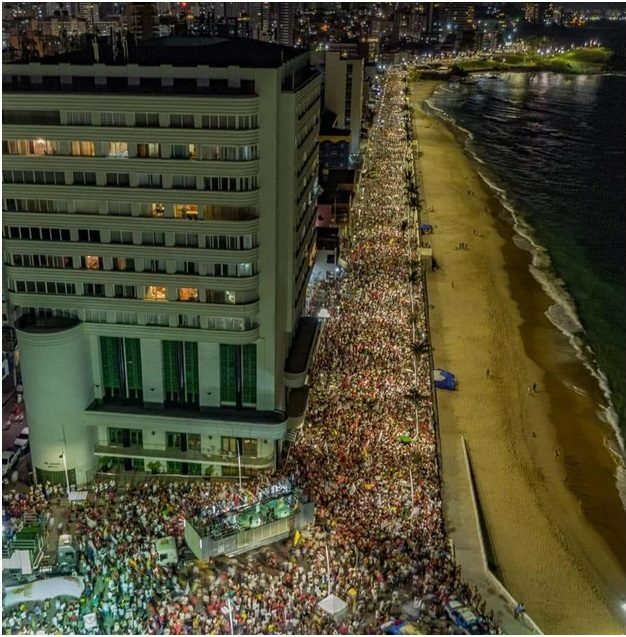 So Bolsonaro makes clear who would be tortured and killed if he were to win – who are ‘we’ and who are ‘they’. Traditional family values should be protected from the impure, identified by him as the left, the poor who steal to survive, the woman who was raped because she didn’t show “respect”, the LGBTI that were not educated well, the Brazilian natives that are less developed, and other minorities that somehow don’t fit in his surrealist world view (these are all his words). This kind of punitive and authoritarian narrative is present in so many ways in our meritocratic culture and our judicial and penal system that it easily finds resonance in people’s hearts and minds. Brazilian society is today deeply polarised, but also unified by disillusionment. There are no more illusions regarding traditional politics, no illusions regarding media neutrality and no illusions that we are one happy and unified people. Both sides express it. But as everything under capitalism finds a way to become corrupted, each of these ‘alternative’ versions of institutions in fact backward steps. 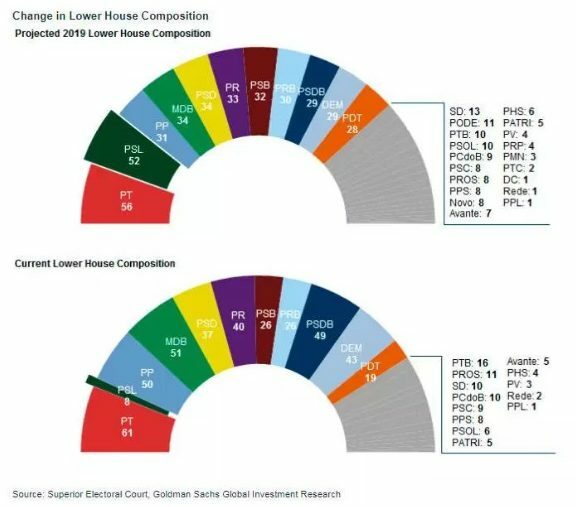 Projections show an even further rightward lurch for the Brazilian Chamber of Deputies. Professional politicians are being replaced by businessmen, as happened in the US with Trump and in the capital of Sao Paulo, with João Doria. It is important to take as a lesson that the left must target private interests, the corporations and businesspeople, not only the state. If the state represents them, then our role is to make that clear. Although Bolsonaro has been in politics for the past two decades, people identify him as a military man who wants to defend his country, and as an honest person who says what he thinks without demagoguery, without “political correctness”. I would suggest that his incapacity to have a single project approved as a deputy also gives the impression he is not a politician. What should properly be seen as a sign of hypocrisy for someone running for president is instead treated as a strength. The traditional media has been replaced by fake news that arrives via Whatsapp and Facebook. Bolsonaro’s campaign started years before the elections, and it has been conducted mainly by these social networks. People were getting so much fake news, videos were edited with false information placed in the mouth of his opponents. Bots were being used to share and like fake news and many fake pages were created to distribute this material. The media reported it but it was too late, years of lies gave them no credibility. Bolsonaro’s supporters are also anti-intellectual, which means that there is no way to reply with knowledge or facts. If the post-modernists claimed there were no more truth they also have their part of responsibility in this plot. It is the task of the left to build a system of thought and praxis where there is a reference that allows us to build an alternative, not only to deconstruct every single thing. This election has also showed that it is the poor people from the North and North-east of Brazil, along with the women, the LGBTI and black communities that are the biggest obstacle to Bolsonaro getting elected. These are the people who had their quality of life increased by public policies adopted during PT Government. People who are directly affected by government policies. People who are aware that they are in the front line of any totalitarian regime. 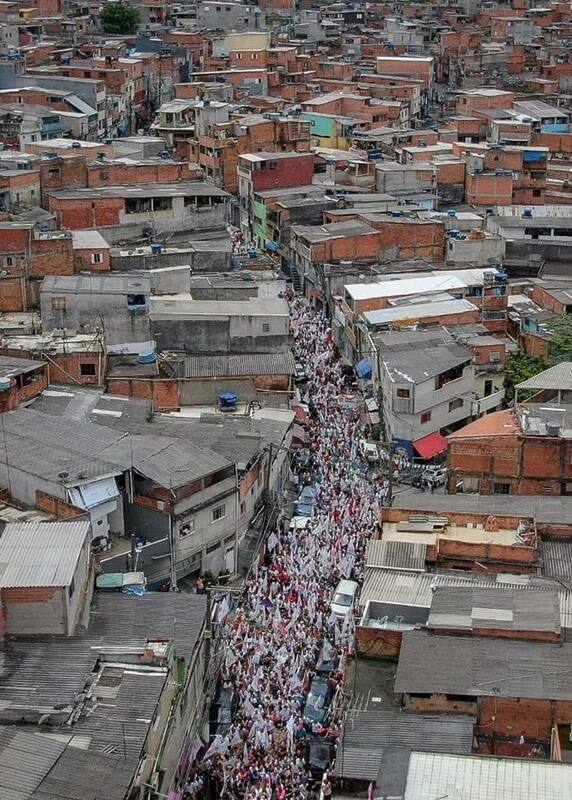 A massive #EleNão protest in Salvador, Bahia. The Northeast was the only region to vote for Haddad in the first round. Photo republished with permission. From the municipal, state and congressional elections, we have seen a growth of right-wing representatives. As the graphic shows, we have not had such a conservative congress since the end of the dictatorship. On the other hand, the left is also reinventing its language and politics, including groups that for a long time were out of the debate, such as black people, woman and LGBTI communities. But more than include we need to expand. To include but with the notion that the fight against capitalism is still our goal so we won’t find our demands co-opted by a market that transforms people’s lives into commodities. We want to be recognised as people but as people who want sovereignty. A direct democracy where our role is not just to press a button every 4 years to vote for a leader who might save us. We must be the agent in the process that governs our lives. We already can see the streets being shaped by this new perspective. From Ireland we will support our comrades in Brazil and we hope to count with the support of our comrades here to fight the rise of the right wherever it poses a threat to people’s lives. The fight is just starting. Brazilian Left Front is a collective created in 2016 to support President Dilma Rousseff and to denounce the ongoing coup in Brazil. During the Repeal campaign she joined MERJ and worked together with DCHA for homes for all.